I'VE been lucky to have had three perfect full moon walks in a row but the Buck Moon promised to be the most exciting yet. Not only was this the eighth full moon of the year, it just happened to coincide with the longest lunar eclipse of the century. This also made it a blood moon, so-called because the moon appears to glow a rusty red during the eclipse as it passes across the Earth's shadow and its brightness starts to fade. All fine and well if you are living in the Middle East. The chances of seeing this spectacular show from Scotland were not so good. With this in mind, I decided to hedge my bets and go out twice in the same 24 hours. The Native Americans called the July moon the Buck Moon as the young stags' antlers are in full growth, but it is also known as the Thunder Moon, in reference to the frequency of thunderstorms. It seems I wasn't the only one hedging my bets. First, I headed up the long single-track road to Kinloch Hourn and parked at the side of Loch Quoich. The names of the Munros here reflect the prevalence and importance of deer. There's Gleouraich, which means roaring, and its partner, Spidean Mialach, peak of the deer. Across the water is Gairich, another mountain which suggests the bellowing of the stags. I have had a few interesting encounters with deer in this glen; once I backed down in a stand-off with a belligerent stag defending his territory, another time I was surrounded by young beasts looking for food, exhausted and hungry after the rut had taken its toll. 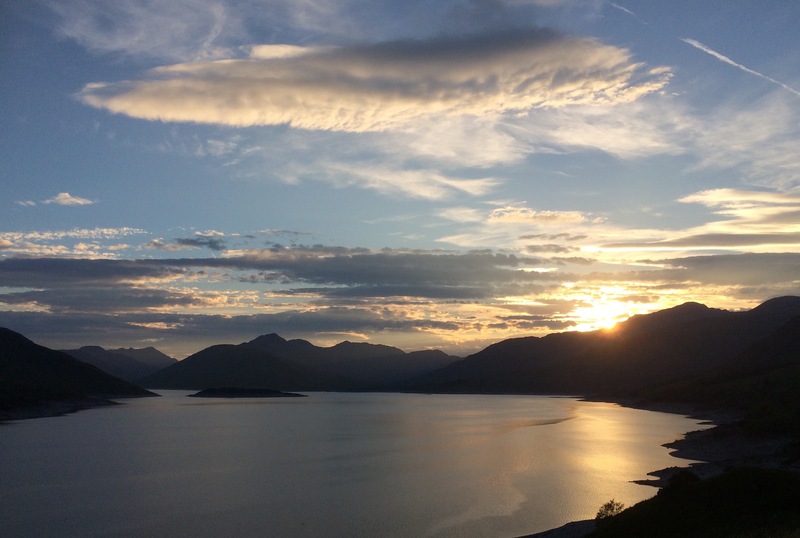 I was greeted by a wonderful sunset, the western skies luminescent, backlit spaceship clouds hanging in suspended animation, and a vast array of mountains forming a dark, jagged outline in a horseshoe round the head of the loch. 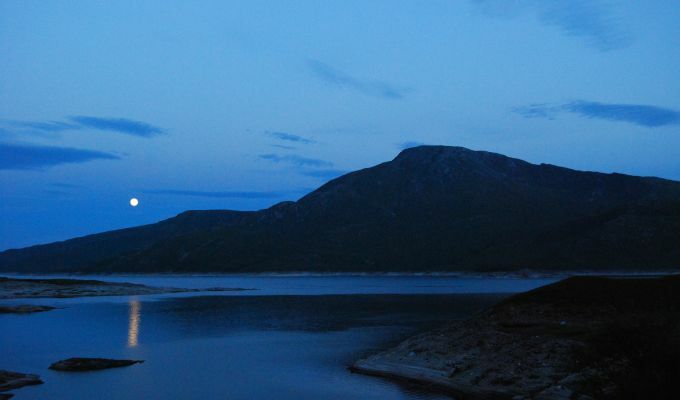 I watched the moon rise and strengthen over Gairich, and settled down to wait for midnight and the turn into July 27, the date of the full moon. The stalkers' path up Gleouraich is one of the finest in the country and makes for fast progress even in the dark, perfectly cut zig-zags in its infancy and then a high-level route which pushes you out to the edge of the slope above the small inlaid section of the loch before climbing to the beehive cairn. The moon was glowing yellow now but its light had faded and the next section needed some careful foot picking until I had reached the bealach. I dropped my pack for a drink and by the time I had lifted it again, Spidean Mialach had appeared. The first light of morning had come in a flash. The initial emergence of sunrise was blocked by towering cloud, a portent of the weather to come later in the day, and when it did arrive it was draped in muted colours. It improved on the descent back west, Gairich leading the line of glowing copper mountains all the way to Sgurr an Ciche and Ben Aden. Then, a warning bark cut through the air; a female deer and its offspring, perfectly camouflaged in the low morning light, suddenly up and running just a few hundred metres away. I turned to look back at the peak I had just descended. Now there were hundreds of deer, the slope crawling with them. And I finally got a good sighting of a young buck, antlers seeming to glow silver with the sunlight flashing off velvet. I reached the car at 7am then drove along the road to a favourite spot looking over the loch to Gairich and promptly fell asleep. Two and a half hours later I woke, ready for part two of the night adventure. I was staying at Aultguish as part of a large group, so I checked in, had a decent meal and then drove back to Achnasheen in deteriorating conditions to wait for any sign of the blood moon. 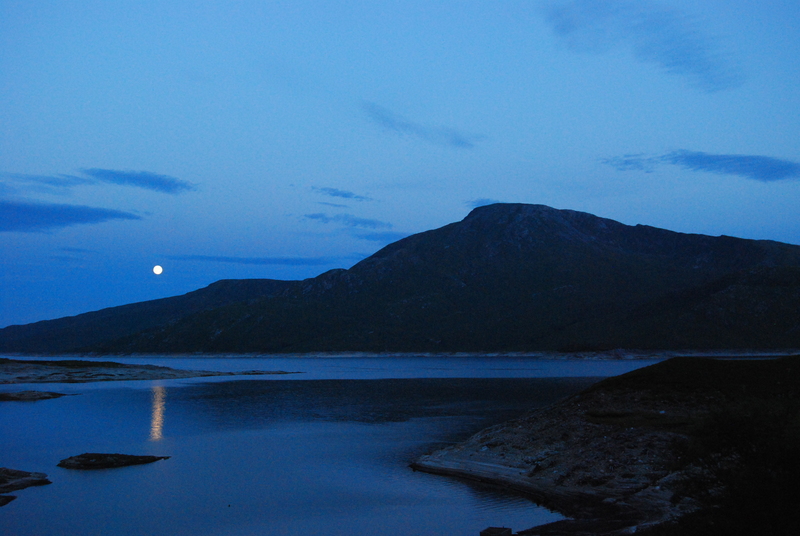 Achnasheen means 'field of the storms' and it seemed a perfect setting for the Thunder Moon. If conditions had been right I was ready to climb Fionn Bheinn. They weren't. I had hoped for the consolation of a glimpse of red across the loch. Better still, accompanied by a thunderstorm of biblical proportions. I got neither. It stayed grey and threatening, no moon, no light. When I returned I was informed that the blood moon had been particularly vibrant in Lebanon. Thanks for that.